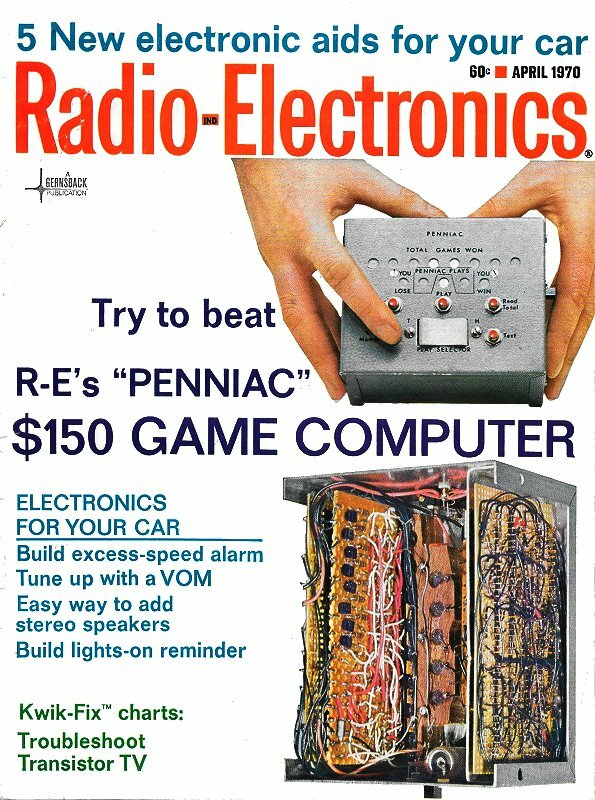 Here is the promised follow-up on yesterday's article, "TV X-Rays Are Back," from June 1969 issue of Radio-Electronics. This x-ray emission issue, whether legitimately a serious health problem or not, was a big deal and was hyped up by the news media the way cellphones causing brain cancer and laptop computers sterilizing men is done today. For a while it measurably affected the volume of color television sales. X-rays are a form of ionizing radiation (unlike microwaves which are not) and can thereby cause cancer by rearranging atoms and molecules. At the root of the problem was the extremely high acceleration voltage (HV) and beam current being used in the cathode ray tube (CRT). Potentials in excess of 25 kV generated the most harmful level of x-rays, so manufacturers redesigned sets to use lower voltages, and also incorporated x-ray absorbing materials like lead around the leakage areas. Black and White (B&W) CRTs used lower levels and were not a problem. Better regulation on HV power supplies help compensate for power line variations. Out of an abundance of caution, viewers were being advised to sit at least six feet from the TV, which might be the root of why our parents used to tell us kids that we'd go blind if we sat too close to the television. Our household didn't get its first color TV set until sometime in the early 1970s, so my severe nearsightedness must be due to something else. Because of the publicity given to X-radiation from color television, the service technician must be familiar with the problem. To protect the public from exposure to dangerous X-ray levels, Congress has charged the Department of Health, Education, and Welfare (HEW) with the task of formulating regulations influenced by the recommendations of the National Committee in Radiological Protection. For color television receivers, the recommended limit of permissible radiation is 0.5 milliRoentgens (mR) per hour, when integrated over an area of 10 square centimeters and when measured at a distance of 5 centimeters from any portion of the television receiver cabinet. Before discussing the possible dangers, remember that it is almost the unanimous opinion of the various investigating committees, that there is no dangerous radiation from any current model receiver when it is correctly adjusted, in good operating condition, and operating on a normal voltage power line. "The radiation level from assembled receivers has been measured both under normal and abnormal operating conditions. Results obtained at a realistic viewing distance of six feet indicates that even under abnormal operating conditions, the exposure dose rate level is close to the back-ground level due to the natural environmental radiation." It appears that the exposure dose-rate from a typical 23-inch color TV tube at a distance of 2 feet will be about ten times the rate measured at 6 feet, and that the dose-rate at 1 foot will be doubled again. Fig. 1 - Top graph shows varying X-ray energy levels from various set parts. 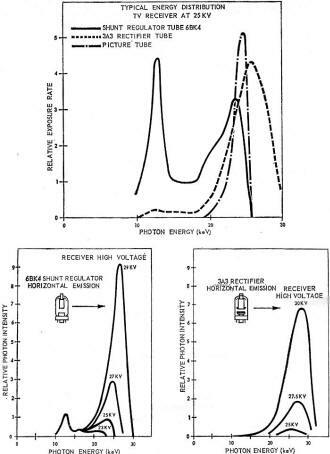 Lower graphs show relative X-ray (photon) emission from specific tube types. When you recall little children with their noses practically glued to the face of the picture tube, the 6-foot rule suddenly becomes impracticable. The receiver must be completely safe under all conditions. X-rays are electromagnetic energy, differing from other forms of electromagnetic energy mainly in frequency or wavelength. All X-rays are characterized by their ability to ionize air or other gases and tissues. This is the characteristic that makes them dangerous to humans. Radio waves are measured in meters or centimeters of wavelength, while the light wavelengths are more conveniently measured in angstroms. But the wavelength or frequency of X-rays is more conveniently designated in terms of "electron volts." Radiation dose is measured in terms of "Roentgens." A Roentgen produces a specific amount of ionization in a certain volume of air under standard conditions. The dose-rate of radiation is, therefore, indicated in Roentgens per minute or hour. Mr. George McCall of the Pinellas County, Florida, Health Department states that X-radiation from the face of the picture tube increases with increasing high voltage. Measurements taken by Mr. S. P. Wang suggest that the dose rate from a 23-inch color picture tube operating at 26 kV is approximately 2 1/2 times its dose-rate when operated at 25 kV. A further increase of 2 1/2 times can be expected at 27 kV. Energy is proportional to the product of mass times the square of velocity. When an electron leaves the gun of the cathode ray tube, it is accelerated to a very high velocity by the regulator voltage (25 kV) and has greatly increased energy. When it strikes the face of the picture tube, its velocity is reduced to zero and, therefore, it must give up its energy. Part of that energy is converted to visible light by the phosphors illuminating the raster. Another small part is converted to heat which is absorbed by the glass, while most of the remaining energy is converted into X-rays. Obviously, the quantity of X-radiation should be directly proportional to the magnitude of the beam current and the value of the accelerating potential; and you might expect the greatest X-radiation when there is a full white raster on the face of the crt. Later we shall see that this is not quite true. About 80% of the electrons entering the electron beam never reach the phosphors, but strike the shadow mask, where their energy is converted into heat energy and X-radiation. As previously indicated, X-radiation is proportional to both the magnitude of the beam current and the value of the accelerating potential. This high voltage is obtained from the flyback transformer and high-voltage rectifier. This system has a dynamic resistance which may have a value ranging .from 13 megohms in some of the early color receivers to less than 8 megohms in more recent designs. This means that as beam current varies with changes in picture bright-ness, accelerating voltage also varies. As beam current increases with increasing picture brightness, tending to increase radiation, ultor voltage decreases, tending to reduce radiation. Tests indicate that radiation from the face and shadow mask is at a maximum with an average picture brightness of a light gray value. There are two distinct philosophies used in high-voltage power supply design. One states that as long as a correct ratio is maintained between accelerating voltage and focus voltage, both values may rise and fall with variations in beam current with-out seriously damaging picture quality. Such receivers have no high voltage regulation. Another group of designers believes that better focus and convergence, better color purity, as well as better control of X-radiation will result if the high-voltage supply is well regulated. The most popular method of regulation uses a simple shunt regulator across the 25-kV supply. This introduces another source of X-radiation. Electrons striking the plate of the regulator tube at 25 kV must give up their energy at the plate in the form of heat and X-radiation. Another regulator type uses a vacuum tube across some low section of the flyback transformer. This tube is biased to cutoff during the trace portion of the cycle, but is gated into conduction during the retrace by a pulse from the damper. This provides a variable load on the flyback that is proportional to the damper pulse. Regulating at low voltage levels greatly reduces the possibility of the regulator generating X-rays. Another source of radiation is the high-voltage rectifier. At first thought, this would seem impossible, since the forward voltage drop across the rectifier is only a few hundred volts. But experiments show that the rectifier tube can be a very potent source of radiation. Electrons comprising the space charge in the rectifier tube are returned to its cathode during the non-conducting portion of the cycle, being accelerated by 25 kV plus the peak value of the negative portion of the ac cycle in the flyback transformer. If the rectifier tube is slightly gassy, the action is greatly increased. Therefore, there are three sources of X-radiation in the modern color TV receiver. They are (1) the picture tube, (2) the regulator tube, and (3) the high-voltage rectifier tube. How Does the Manufacturer Protect Against Radiation? Radiation from the rectifier and the high-voltage regulator can be safely held within the confines of a well-designed high-voltage cage. What then, if any, are the dangers of exposure to X-radiation by the viewer? How can the technician safeguard his customer? First, encourage the set owner to observe the 6-foot viewing distance whenever practicable. Check the power line voltage. Radiation increases when the receiver is operated on high line voltage. The high-voltage power supply increases about 300 volts with each 1-volt increase in line voltage. Thus, an increase of a little more than 3-volts in line voltage can produce a 1,000-volt increase in high voltage along with the accompanying increase in radiation emitted. Check the adjustment of the 25 kV setting. Remember, the most likely cause of excessive X-radiation is abnormally high voltage. Tests indicate that radiation from the picture tube face is greatly multiplied by each 1000 volts above 25 kV. The Pinellas County (Florida) Health Department reports that of 149 color television receivers surveyed at owners' requests, 23 sets were emitting excessive radiation. Nineteen of these cases resulted from excessive high voltage. Replace all "weak" high-voltage rectifier tubes and regulator tubes, since gas and/or poorly aligned electrodes in the rectifier greatly increase radiation from the rectifier, and since reduced emission and/or transconductance of the high-voltage regulator increases radiation from both the regulator and the picture tube. Check all components of the metal high-voltage cage. This cage not only protects against accidental shock hazard, but shields X-radiation emanating from the regulator and rectifier. Surveys conducted by several interested agencies have found hundreds of receivers emitting radiation in excess of the established "safe" limits. In almost all cases, the situation could be corrected by restoring the receiver to its original condition with the replacement of substandard tubes and components and the correct adjustment of high-voltage controls. While there is little difficulty in guaranteeing that the receiver leaves the factory in "safe" operating condition, there is at present no method of insuring that this condition will be maintained in the owner's home during the set's useful life. Manufacturers are, therefore, turning their attention to the development of "fail-safe" circuits (see "Add Anti-X-Ray Circuit to Your Color Set," Radio-Electronics, January, 1970). The most promising approach to this goal seems to involve the use of solid-state horizontal amplifier circuits feeding a much lower voltage flyback transformer, which in turn is followed by a solid-state voltage multiplier type of high-voltage rectifier to produce the necessary 25 kV. This is regulated by a gaseous cold-cathode high-voltage shunt regulator incapable of generating X-rays. Solid-state amplifiers, rectifiers, and dampers cannot generate X-rays. One such diode regulator was developed in 1948 by Victoreen. It has been successfully used in many military and scientific applications to control high voltage at low current. These applications include radar display circuits, geiger tube circuits, photomultiplier applications, low-power klystron and traveling-wave tube circuits as well as many others for simple but precise control of high voltage. The diode was used by three manufacturers of early color television receivers, but cost prohibited its consideration when the market became highly competitive. Recent design improvements, which adapt the diode to the demands of the flyback power supply, along with improved and expanded production facilities, promise to reduce diode prices to a level that could be economical in the home entertainment field. The performance of a solid-state diode high-voltage regulator is almost identical with that of a Zener diode operating at much lower voltages. Its operating voltage is almost entirely controlled by its gas pressure. It has no filament or heater to be affected by changes of line voltage or deterioration with age. Its operation is not affected by changes of cathode material work function. Any conceivable failure mode results in a lowered operating voltage. Even if the metal envelope of the diode were punctured, allowing its gas content to escape and be replaced with air, it would continue to regulate, but at a greatly reduced voltage (about 14 kV), Therefore, since the proposed TV receiver has but one component that can generate X-rays (the picture tube), and since it is completely "safe" when operated at 25 kV or less, and since the Victoreen diode completely guarantees that the voltage will remain at 25 kV (or below in case of failure), the new design is completely "safe" for its entire life and cannot produce dangerous radiation even when controls are misadjusted. It seems likely that the industry will adopt this circuit philosophy, and that retrofit kits will be made available so that the service technician can modify existing older receivers, making them completely "radiation proof." Can Technicians Check for X-Rays? The price of survey instruments with accuracies of plus or minus 10% and registering in units of milli-Roentgens per hour as required by Federal regulations, ranges from $800 to $1000. Their use is, therefore, restricted to organizations which find that price justifiable. Radiation is produced when electrons at high velocity strike a target and give up their energy as X-rays. It follows that the energy or wavelength and frequency of the resulting X-rays are determined by the voltage that accelerated the electron. The resulting rays are then measured in terms of "electron volts." This unit is the energy required to move an electron through a potential of 1 volt. Thus, the primary radiation generated in the TV receiver has energy values peaking around 25,000 electron volts (25 keV). Unfortunately, our situation is not quite as simple as it might at first appear. When X-rays penetrate a material, some of their energy is absorbed by that material, and the emerging rays are of a lower energy level. At the surface of the material being penetrated by the radiation, an interesting situation occurs. Regardless of the energy level of the X-rays entering a material, much of the emerging energy peaks around a discrete energy value that is characteristic of the particular absorbing material. Thus, X-rays generated in a tube at 25 keV, and penetrating a lead-glass envelope emerge having a spectral content from 25 keV and below but peaking at 25 keV and 12 keV. The latter is known as the characteristic "lead line." Experiments by several independent investigators indicate that the spectral response illustrated by Fig. 1 is typical of the radiation from most types of color TV receivers. Note the difference between the content of the energy from the picture-tube face and that from the rectifier and regulator. Since the danger of radiation comes from its ability to ionize air or tissue, the energy distribution of a particular flux becomes important. The most direct and accurate means of measuring the ionizing ability of any particular flux of radiation would be to measure the current flowing from a calibrated ion chamber located in that radiation beam. Unfortunately, this requires the accurate measurement of currents as low as one millionth of a microampere. Obviously, this type of instrument is both delicate and expensive. Due to the action known as "gas multiplication," the pulses of current from each ionizing event intercepted by a Geiger tube are increased to such a magnitude that no delicate and sensitive amplifier is necessary to record them. However, the Geiger counter records "counts" or ionizing events per minute, and is not a measure of energy or "dose rate" or Roentgens per unit of time. Since all pulses or "counts" are of equal magnitude regardless of the energy of the original photon which initiates the pulse, "counts per minute" can be translated into "milliRoentgens per hour" only at anyone discreet energy level of radiation, and such translation is, therefore, not valid where the flux has a wide spectral energy distribution. 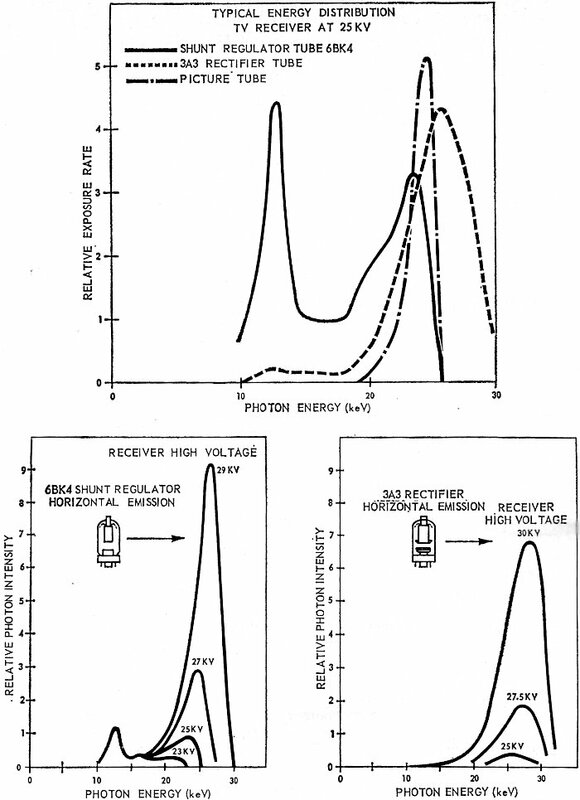 In addition, the energy response curve of any Geiger-Mueller (GM) tube is extremely nonlinear. However, let one assume that the spectral distribution curves of Fig. 1 are typical. Then a survey instrument using a GM tube of known energy response and calibrated in the actual flux from a TV receiver so adjusted to produce considerable X-rays might be developed. Using an ion chamber instrument as a calibrating standard could result in accuracy, simplicity, and price compatible with the needs of the typical television technician. Such an instrument would require one acceptable limit for readings from the face of the picture tube and another when readings are taken from the rectifier and regulator. It is hoped that such instruments will be available in the near future.